In a world of screens and high-tech gadgets all around us, it’s sometimes hard to remember the simple pleasures of childhood. 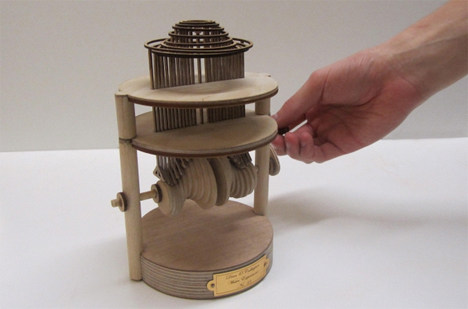 This hand-cranked automaton from designer Dean O’Callaghan is a delightfully simple toy that just happens to be completely mesmerizing. 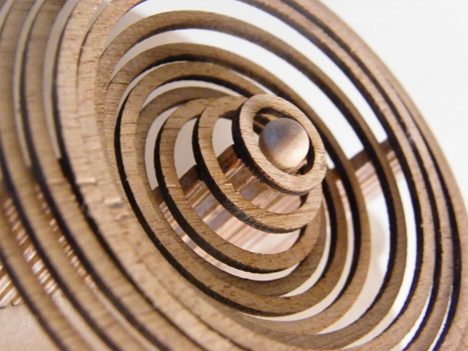 As the user turns the crank, concentric circles rise and fall around a central sphere. The sphere represents a single raindrop while the circles are the ripples echoing away from the point of the drop. This beautiful wooden toy is the kind of low-tech entertainment that we don’t see often these days. O’Callaghan has plans to create a kit that people can put together on their own at home. See more in Art of Tech or under Technology. April, 2014.